October 2016 was the month of exciting seminars strengthening global mindset and entrepreneurship with technological expertise. Six Capital, AEISEC volunteers, Coventry University, Georgia Institute of Technology (Georgia Tech), Case Western Reserve University and Stanford University were our partners in this series of seminars. Six Capital taught students how to use data to predict financial markets. Prof. Jennifer Widom shared with students practical tools to analyze big data. AEISEC volunteers shared the transfer process of knowledge in entrepreneurship and rural tourism as practiced in Colombia to Maluku. Prof. Paul Jones covered transformational entrepreneurship. Prof. James Hoadley talked about business culture in Japan. 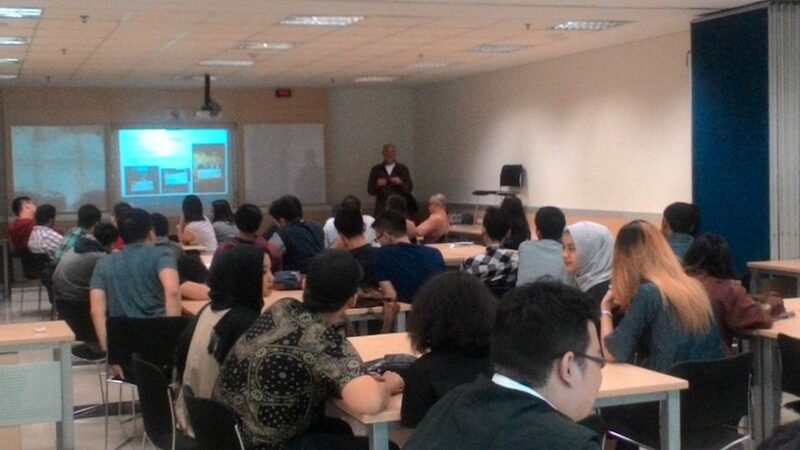 Prof. Daniel Lacks encouraged BINUSIANS to use latest technology in planning their business ventures in Indonesia. On September 30th, 2016, Six Capital, company that harnesses information from the crowds to generate and analyze data for insights on high probability winning investments, delivered a seminar on foreign exchange, Six Capital approaches, and alpha and micro learning, i.e. learning how to learn and using micro-knowledge in systems thinking. 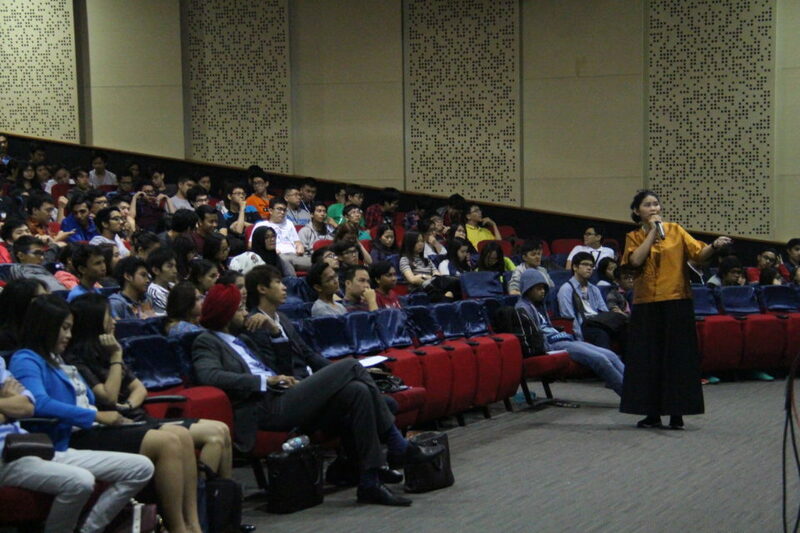 More than 500 students joined the sessions in Anggrek Auditorium, while 130 students streamed the seminar online. Students were happy to be able to ask questions to Grace Tjahja, Six Capital President Director of Indonesia, Ang Ying Chong, the Deputy Chief Dealer, and Jaiprakash Singh, the Executive Vice President of Special Projects. Over the coming period, the hope is for the students to get access to alpha and micro learning laboratory to support newest approaches to teaching financial markets long-term. From October 18-19, 2016, AEISEC volunteers shared their experience on how they help build their careers and Maluku community through tourism development efforts. AEISEC is an organization that links student population with volunteering and internship opportunities in their fields of interest with projects expected to have immediate impact at end of deployment. More specifically, a group of students from Colombia with entrepreneurial and tourism background completed tourism development project in Maluku engaging local communities for “Inclusive Tourism and Wonderful Maluku”. Afterwards they visited University of Indonesia and BINUS UNIVERSITY to share about their projects and how they localized their knowledge and experience from Colombia to help develop tourism of Muluku. On October 24, 2016, Prof. Paul Jones of Coventry University as Deputy Director of International Center for Transformational Entrepreneurship, which aims to develop systematic approaches to entrepreneurship globally, held a workshop on transformational entrepreneurship looking to excite students about projects that help develop communities and safeguard the environment. 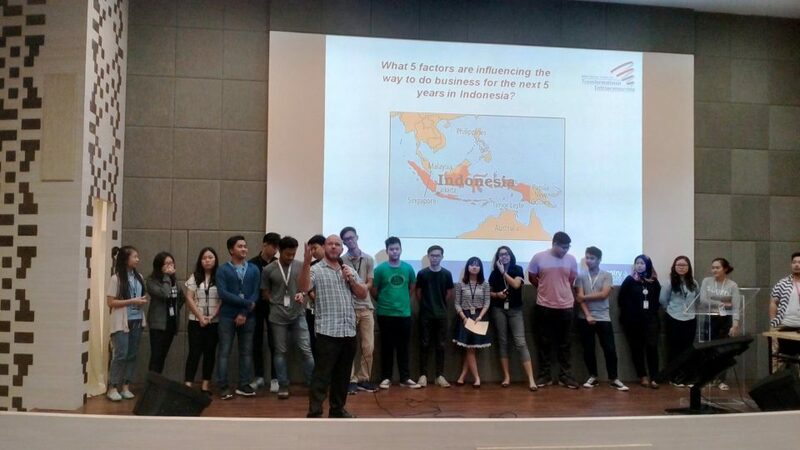 Students were encouraged to share their ideas on what types of businesses Indonesia needs and what businesses specifically students hope to start once they graduate. 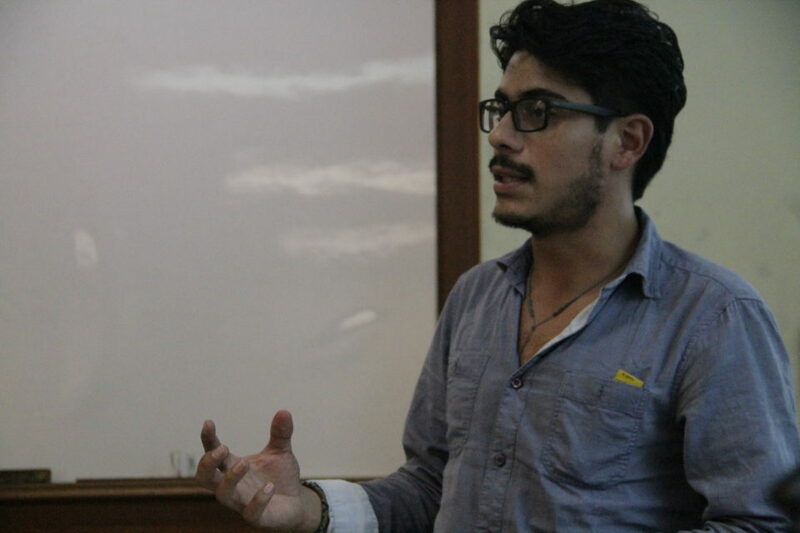 The speaker moved between the isles of the auditorium connecting with students and inspiring them to maintain and refine their entrepreneurial dreams. Prof. James Hoadley of Georgia Tech who is Associate Director of the Center for International Business Education and Research, held a lecture on understanding Japan on October 25th, 2016. Having spent many years in Japan and having interacted with Japanese businesses, Prof. Hoadley was able to share his knowledge about this important country in Indonesian and regional economy, specifically about its culture, people, business etiquette, going into fascinating details such as office space arrangement. Prof. Daniel Lacks of Case Western, the chair of the Case School of Engineering’s Department of Chemical and Biomolecular Engineering, is involved in different entrepreneurship efforts. At BINUS, on October 26, 2016 he held one entrepreneurship workshop attended by business and computer studies students and a sharing session BINUS entrepreneurship teachers and incubator. Case Western recently opened think[box], university’s entrepreneurship and innovation center where university and local community are encouraged to use latest technology, such as 3D printing, in charting out businesses. At BINUS, students developed business plans which they shared with peers for feedback in 10 minute videos with each group covering one of the sectors relevant in the Indonesian economy such as hotel or coffee businesses. Already proud with alumni from Indonesia, Case Western is looking to deepen and strategize this relationship, planning to invite students from Indonesia to participate in projects of their think[box] to help Indonesian youth seize opportunities on the Indonesian market. On October 31, 2016, BINUS closed October series of workshops with another data focused day. Prof. Jennifer Widom, Fletcher Jones Professor of Computer Science and Electrical Engineering at Stanford University, has a passion for nontraditional data management. Currently on sabbatical and travelling in the region, Prof. Widom is holding free short courses in data and design. 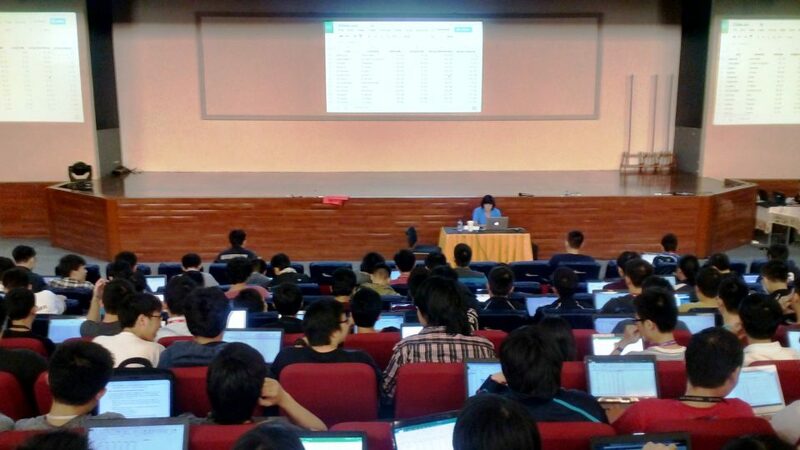 She held a one day workshop for BINUS students on computerized analysis of complex data sets. Our computer engineering, computer science and information systems students expanded their big data knowledge through this workshop by applying specifically Google Sheet as a practical tool in analyzing a case.